Dorner recently worked with a customer who needed to take a case and flip it 180° within a short distance. The case was slightly bulky at about 1’ x 1’ x 10”. While there are many different ways to rotate cases, the customer wanted a way to positively control the product as it rotated. Dorner tackled the challenge using a 180mm wide SmartFlex with FlexMove Technology. The platform’s flexibility in the frame of the conveyor enabled it to be twisted over a distance. Two of these conveyors were used per 90° of rotation. 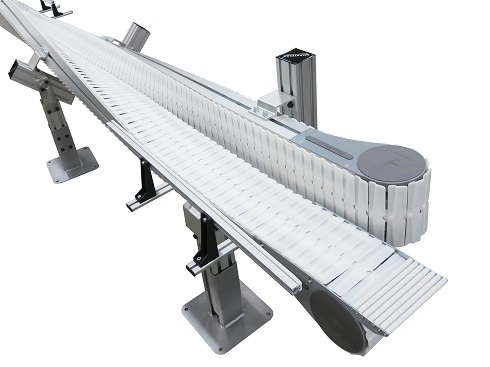 One conveyor started as the bottom conveying surface and gradually twisted perpendicular to the new conveying surface. The other conveyor started perpendicular and gradually twisted to become the bottom conveying surface. In addition, guiding was used to help control the product as it entered and exited the twist conveyors. To learn more about the many different SmartFlex configurations visit the SmartFlex product page.